The object of Schmovie is to come up with funny titles for made-up movies based on a film genre (determined by the roll of a die) combined with an outlandish premise (generated by flipping two cards). Schmovie is all about creativity, humor and laugh-out-loud fun for the whole family. What would you call an action film about a killer sandwich? Rye Hard … Beauty and the Beef … Despicable Meatballs … you get the point. Collect Schquid trophies for winning titles as you laugh yourself silly. Inside each box of Schmovie Family Edition: 85 What cards, 85 Who cards, 19 Schquid trophies, 1 genre die, 5 erasable title boards, 1 rule sheet, 5 erasable markers, 19 trophy bases and unlimited awesomeness. 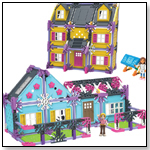 Build your dream house from the ground up with Brianna and Sophia in the Home Designer™ Building Set. Sophia loves building, while Brianna helps with the finishing touches of the interior. These best friends are a dynamic duo when it comes to building and decorating houses. Help them build different styles of houses - a colonial, a brownstone, and a ranch. Decorate the houses using the included accessories and make their home, your home with the Home Designer™ Building Set from Mighty Makers®. Most models can be built one at a time. Includes 433 K'NEX parts and pieces. From: FAT BRAIN TOY CO.
Other products from FAT BRAIN TOY CO. 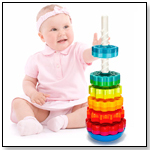 This stacking toy also spins. When colorful discs are dropped on the threaded corkscrew pole, they spin all the way down. The base can be used either flat for a steady base, or turned over for a wobbling base that adds an extra challenge (and extra fun). Create your very own treetop hideaway with the 3-in-1 LEGO Creator Tree house. Open the secret trapdoor and climb up the fold-down ladder. Use the gray bucket to lift supplies up with the winch. Fill the red bucket with water and tow it up to keep unwanted guests away. This detailed playhouse includes a yellow wagon for transporting all your favorite things to your treetop hideaway, a hollow tree for storing your secret treasure map and a dog. Remove the roof for easy access to the storage area and sleeping bag, or detach the entire Tree house. Rebuild into a cute lakeside hut with a jetty and pizza oven or a 2-story farmyard barn with a garden and wheelbarrow using the supplied alternate building instructions. Includes a child minifigure. Colorful cling creations in minutes! the Crayola cling creator lets kids create their own repositionable icons that stick to, and peel from windows, mirrors and other flat, smooth surfaces. Build and display these authentic, well-loved birds! 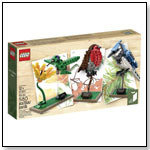 LEGO Ideas brings you 3 incredibly detailed models of iconic birds from around the globe-the Blue Jay, Hummingbird and Robin. Put down your binoculars and get closer to nature with these intricate LEGO models of well-known birds! Created by keen gardener and bird enthusiast Thomas Poulsom and selected by LEGO Ideas members, each replica bird hails from a different continent: the Robin from Europe; the Blue Jay from North America; and the Hummingbird from South America. These beautiful and detailed models come with their own presentation stands showing their scientific names, so that you can display your birds for all to enjoy or detach and play as you wish. This set also includes 3 booklets containing lots more information about each of these fascinating species as well as the creator of these amazing models. Features 3 models: a Blue Jay, Hummingbird with flower, and a Robin. Can you make a paperclip float? What are magnetic fields? How does a compass work? These astonishing activities will reveal the fascinating world of magnetism. Success is guaranteed as you discover the power of this invisible force. Contents: 2 Ring Magnets, 1 Bar Magnet, 1 Packet of String, 1 Compass, 1 Washer, 1 Galaxy Map, 1 Fizz Token, Detailed Instruction Manual. This puzzle features dramatic dinosaurs in an exciting prehistoric scene. 2' x 3' when complete, it features 24 extra-thick pieces with an Easy-Clean surface to keep them looking like new. Perfectly crafted, curved puzzle pieces allow for an exact fit and are easily assembled together to form a solid, smooth ball - with no glue required! Includes Base Stand. Three really bright and colourful Disney Frozen jigsaw puzzles for fans everywhere to enjoy! Each of the puzzles features key characters from the popular Disney Movie. Each puzzle is cut to 49 pieces. The puzzles are marked on the reverse with a different pattern, so that puzzle pieces can be readily sorted before being assembled Puzzles are an excellent way to encourage your child’s observation, imagination and communication skills. Ask questions about the picture or get your child to talk about the picture – for example ask them to name the characters, what they think is happening, and even what some of the characters are saying. 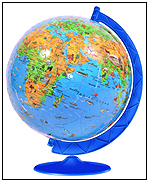 Ravensburger Puzzles are easily identified by the "blue triangle" logo. A fun and educational way of discovering the planet. Each magnet represents a country or region of the world, with its name, capital and an illustration characteristic of that part of the world. The big magnetic board shows the world with its continents and oceans: the colour used for each region helps you find its place. Have fun putting each country in its place and you will have a wonderful map of the world which you can hang on the wall. Wood : Plywood (tray + magnets). Printing : sticked paper.Delivered shrinkwrapped. Cardboard wedge provided in the master carton to protect the world maps during delivery. Remote Control Stunt Vehicle. Assorted colors, Red or Blue. Comes with 5 sounds and mute. Does flips and stunts. Instructions for advanced moves on the packaging. Turn a young girl's dreams into reality as they watch Flutter bye Fairies effortlessly dance through the air. Every enchanting flight puts the magic directly in their hands. Flutter bye's gracefully glide across the sky guided only by the hands of young girls. There's never been a more magical experience. 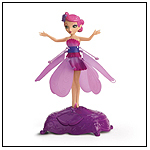 Put the magic in their hands with the charming flight of Flutter bye Fairies. Since 12/28/04 people have visited this page. · Why We Go To Toy Fair - Or Stay Home! · Preparing For Toy Fair - Tips and Tricks for Retailers!